TV420...what did I do wrong?! Hi everyone, just hoping to get some advice on what I may have done wrong with this bodice. It was for a Steampunk event here in the UK recently, and I was grumpily up late sewing on buttons and couldn't even stay awake long enough to try it on and check the fit. Then in the morning, I made the shocking discovery that it didn't fit right! Admittedly, I didn't do a mock-up, but that was because I've already made this top before but I made the bottom edge closer to the waist and there were no major problems. The back seems to fit just fine, it's just the area across the chest.There seems to be a lot of pulling across the chest, and I kind of look like a mutant (there is one button sewn on in sightly the wrong place which is adding to the problem, but is not the source). I'm tempted to say that I may have sewn the sleeves on the wrong arms, but I'm not sure how to check this. Any ideas? Also, on a minor note, the sleeves on this top are very tight, how does one adjust the sleeve so that there is more room? What I actually wore, just in case you were curious! Re: TV420...what did I do wrong?! So my back width gave me size H for back and side pieces. My adj. back was 21.5, and I subtracted that from my bust, which gave me 10.5", so I chose size A for my front. I think this is where it all went wrong. Size A was fine for my waist, but not for my bust, even though the maths worked out right. What can I do to correct this? It seems I have quite broad shoulders, a small waist, and small bust. It looks to me like the sleeves are too small for the armhole. So either the armhole needed to be smaller to fit your body and sleeve, or the sleeves need to be a bigger size to fit your body and bodice. Due to the bunching at the front, I'm would bet that the armhole needs to be smaller. Honestly, I have never seen anything that that front, so I am not sure what happened there. But it almost looks like the armhole was gathered to fit the sleeve under the arm. The first thing to do would be to take the sleeves off and get the bodice to fit properly. The back does need a little bit of fixing. The upper back is fine, but the waist needs to be lifted up a bit to match your actual waist, and the hip needs to be let out at the back and side seams to smooth out over your hips. Boning would help keep it looking smooth, once the bodice is fitting correctly. Back to the front, I am thinking that you need to shorten the upper shoulder about 1-2". Make a large horizontal tuck in the fabric, half way between bust and neck, from shoulder to shoulder. This should remove all those wrinkles. It also looks like the fronts are too narrow across the bust. For your next bodice, I would cut the back 1 or 2 sizes size smaller, and see if that gets you into a larger front size. If not, then I would cut the side piece smaller and add that distance to the front pattern piece. The front corner of the armhole is too far forwards and needs to move back closer to your armpit, making it narrower under the armpit, if that makes sense. Once you get these fitting issues corrected, you can most likely sew in the same sleeves, and all will be well. The sleeves are just being stretched to far to fit into a too big armhole, that is too big for your body. Oh, you posted again before while I was typing! I am looking again at the back view, and while the left hand side of the shoulder looks only a little bit wide, the right hand side looks waaaay wide. So I think the 16" back width is way to wide for you. On the rigth hand side there is a shadow about 1 1/2" in from the armhole seam, that looks like it might be caused by a chemise strap? or something? Anyway, that location looks to be exactly where you want to measure to and from for the back width. Heather, have you ever thought about making a picture tutorial (or even better a video tutorial!) on how to get the right measurements? Seeing how you would choose the sizes for a few different bodies would be very instructive. Actually, yes, I have thought about it a lot, for the last year or so. Unfortunately, I just haven't found much time for it. I would like to do and entire section on measuring and fitting. But that would take a couple assistants, as well as a lot of time. I would love to do a sequence of videos, but I think I would have to settle for photos as a more realistic goal. Thanks Heather! I can see there are a number of things that just didn't fit quite right with this now. I'll have to have a play with the patterns like you suggested and see if I can get the right combination of pieces. For the current bodice, I think I'll take off the sleeves and see if that doesn't relax the rest of the bodice enough. I remember when I was putting them on and I was having a really difficult time getting them to fit in correctly, so maybe something funny did happen there. I definitely didn't gather under the sleeve though! I found the pattern I used last time I made this (but altered the length so that it stopped around my waist) and I used size H for the back and sides, but I used size B for the front. I didn't have this problem that time. Should have checked before making this one! I'm not sure what you mean by the 'upper shoulder' and where I would make the horizontal pleat. Is that something I could do on this bodice to try and save it? Or something I should do to alter the patterns before cutting it out? Also, are the sleeves really supposed to be so tight? I can barely bend my arms. How can I change the patter so that there is a little more room for my biccep and elbow without making the arm-hole larger? The tuck across the upper chest works great for mockups and patterns testing, then transferring this change to the pattern before cutting the pattern. If working with the final bodice, you would need to recut the shoulder and neckline lower down, shortening the front from armpit to waist. What size sleeve did you cut? If it is too tight, then go with a larger size sleeve. When you sew the sleeve into the armhole, there should be about 1-2" of ease in the sleeve that needs to be eased in. If you like how it fits into your adjusted armhole, but just want it larger down the arm, then you can add more fabric to the back sleeve seam. Instead of the line curving inwards to the elbow, make it straight, or even bow out a little bit. just an update...I took the sleeves off and when I tried it on, that pulling on the front went away. There's still the other fit issues that Heather mentioned (i.e. waist needs to move up and the back is too wide). I found my sleeve pieces, and it looks like I made size B because my armhole measurement was 16". So, maybe it was too small for the body pieces after-all? I might try making some larger sleeves. 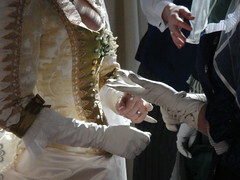 Alternatively, I might just try putting the ball gown sleeves instead. Location: Where ever I go, there I am. Currently Arlington, TX. This is going to sound completely corny, but if I am having a hard time with getting the back width measure I put two ruler in my clients armpits (as high as I can get them) and measure between them. So far this has worked really well.